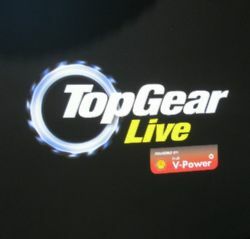 For something a little outside the square the misses bought me a couple of tickets to Top Gear Live at the Acer Arena on Sunday 8th February. As she was so kind I felt I would return the favour and drag her along with me so on a stinking hot day in Sydney we headed off to see how Clarkson and Hammond would entertain us. 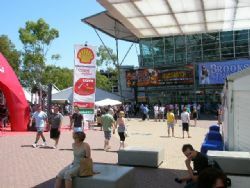 We arrived about three quarters of an hour before the show and were greeted by throngs of people, thirty six degree heat and a fenced compound around Acer Arena full of sponsors. With a bit of time up our sleeves we promptly went to check out all the stuff outside the arena. This lasted for all of ten minutes in the heat until common sense prevailed and we sought refuge in the air conditioned arena. 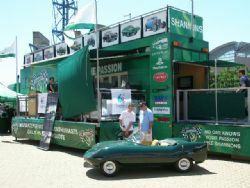 Outside Shannons had their big rig set up, Shell had a bevy of babes giving away vouchers and touting the benefits of V Power, there were car makers, racing cars and various other tents that we quickly lost interest in favour of a cooler environment. There were all the usual suspects in the super car category present. Ferrari, Porsche, Aston Martin, Audi R8.... The lights dimmed and the entertainment started with live ads – cars driven on stage, thumping music, overhead light show supported by big screens running ads – a mega production for those involved. After a few of these the natives were getting restless and the crowd started heckling – no more bloody ads! When Clarkson and Hammond finally made an appearance in a couple of super cars the crowd started to settle down. After the mandatory intro they quickly moved on to slagging off May who wasn’t present by insinuating he was last seen in Oxford Street and enjoying himself at the gay mardi-gras. Having no pre conceived ideas at all about what would be involved in the show it turned out to be quite entertaining for the hour and bit they performed. They dragged in Steve from Top Gear Australia to add a bit of local flavour and got the audience involved with the Cool Wall by voting on a range of cars paraded before everyone. The mandatory Ford versus Holden debate was raised with the audience voting by colour coded cards as to their preferences. Numerous burnouts, drifting and precision driving segments broke up the oratory and for some light entertainment a soccer match between Australia and England was played out using an assortment of Hyundai’s and a very large soccer ball. 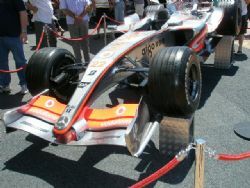 Australia won, the Hyundai’s did not fare well and some panel beaters out there will be very grateful for this segment. Clarkson is on record numerous times for his dislike of bikes so it was somewhat surprising when a rather small round cage was rolled out and a bloke on a trail bike started riding around it, across it and upside down in it. Turns out he was a mad Frenchman, and he had mates. Next thing a second bloke joins him, and with two in the cage going for it you could barely swing a cat in there. When a third mad Frenchman joined them, the odds of seeing blood dramatically increased. I was gob smacked when the fourth bloke got in there – all of them riding in this tiny cage flat stick across, upside down, around – nuts. No blood, big applause, very impressive. There was other stuff – Steve getting pushed by a Shelby Mustang in a shopping trolley into some massive bowling pins, races on ill conceived tiny contraptions around the stage, jokes with the normal adult themes and the like. Then there was the lap – a computer generated affair shown on the big screen that was driven by the audience based on colour coded cards and the speed determined by how loud they screamed. You had to be there, I can’t explain it. And of course the board on how the lap time went. We did the 2.00pm session on the Sunday and the audience screamed themselves hoarse and posted the best time against all the other countries and Sydney audiences. The last segment was the Stig driving a Lotus Elise around the stage whilst being shot at by a computer generated attack helicopter. It ended with Clarkson deploying a ground to air missile and shooting down the helicopter. Oh, I forgot to mention the audience viewed all this with 3D glasses and as the helicopter imploded into a gazillion bits all seven thousand spectators in the arena ducked. Again, you had to be there. Clarkson and Hammond had obviously done this gig in various venues on their world tour and the banter and jokes flowed freely, the wit and taking the piss out of most things was clearly evident and they appeared to be enjoying themselves. Judging by Clarkson’s voice, which was scratchy at best, they have obviously had a fat time on tour. The big surprise for me was the audience – you would expect lots of blokes but there were as many women there, families, grannies, kids – all demographics were there in droves. Everyone was smiling as they headed out into the heat and horrific queues to pay for their parking tickets.